Want to get your hands on some celebrity clobber plus do a good deed for the day? Look no further than the Rumble In The Jungle jumble sale. 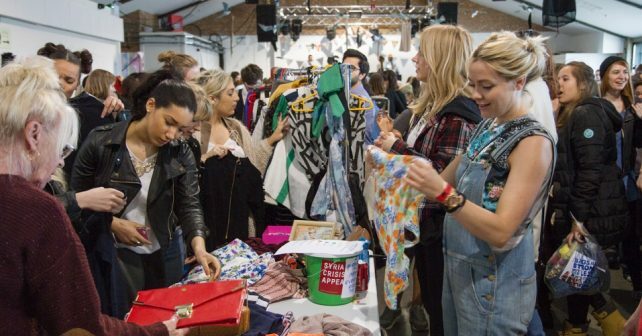 The charity event at the Oval Space in Bethnal Green is back for its sixth year selling old threads from musicians, DJs, artists and telly presenters as well as some top fashion brands. You can go home with Roy’s cardigan from Coronation Street! There’ll also be donated items from Sara Cox, Kasabian, Florence Welch, Fearne Cotton and Mark Ronson. Fashion brands Vivienne Westwood, House Of Fraser, Whistles and Anthropologie are also on board too so keep an eye out! DJs Clara Amfo and Gemma Cairney – among others – will be playing some tunes and crowd pleasers throughout the day. Organisers are hoping to top the mammoth £33,000 raked in and donated at the 2016 event. All proceeds from this weekend’s sale are going to Oxfam’s Refugee Crisis appeal. Sunday, April 29th, 12pm-5pm, £5 on the door with a bag of jumble. Rumble In The Jungle, Oval Space, E2.